Calderdale councillors have approved the controversial Local Plan, which will shape where the borough’s homes and businesses might be developed over the next 15 years. They voted by 28 votes to 18 with Mayor of Calderdale Councillor Marcus Thompson (Con, Skircoat) abstaining. All Labour and Liberal Democrat councillors, plus Independent Colin Raistrick (Hipperholme and Lightcliffe), voted in favour of the plan with Conservative councillors and Independent Conservative Mike Payne (Sowerby Bridge) against. Demonstrators for and against Calderdale’s Local Plan confronted each other before the meeting at Halifax Town Hall last night (Thursday). Those against the plan, mustered by megaphone-equipped Conservative group leader Councillor Scott Benton (Brighouse) came face to face with those in favour, including trade union and left group supporters, to which Cabinet member for Planning, Housing and Environment, Councillor Dan Sutherland (Lab, Illingworth and Mixenden) lent his support as the two groups went eyeball to eyeball. Inside the council chamber, Conservative councillors voiced their opposition to the plan citing reservations about infrastructure planning, a disproportionate amount of homes marked for South East Calderdale in Brighouse, Rastrick and Hipperholme, poor distribution of allocated areas and questioned whether public responses had been properly evaluated. But Labour, supported by the Liberal Democrats, hit back, accusing the Conservatives of misleading people about numbers in the recent election campaign, producing no plan of their own, ignoring work done by officers in a series of detailed reports and millions of pounds of investment secured, and not taking Calderdale’s unique geography and topography into account. Government insisted a plan had to be produced and if it was not approved it was likely Government would take over the plan and local control over its detail would be lost. An amendment by Councillor Ashley Evans (Liberal Democrat, Warley) to Cabinet’s recommendation from last week to approve and publish the plan, to detail road usage to help planning processes was approved but Councillor Geraldine Carter’s (Con, Ryburn) amendment to remove limits on debate fell. The real battle began when Councillor Benton’s amendment proposing the plan be rejected was debated, filling most of what was a marathon four and a quarter hour session of debate. Councillor Benton said his party could not support the plan which relied extensively on two Garden Suburbs, at Woodhouse, Brighouse, and Thornhill, Rastrick, which would supply 30 per cent of the homes needed – 12,600, although some sites have planning approval already in place, leaving a likely total of around 9,000. “The Local Plan relies extensively on the Garden Suburbs. Without these the plan falls down as it cannot meet the basic housing requirement,” he said. With serious concerns about lack of detail in infrastructure planning, for example how, where and when highway works would be funded with traffic congestion at breaking point already. It also did other areas of Calderdale a disservice as they would not get the benefit of the investment that would come with new homes, including areas which badly needed more affordable homes, he said. 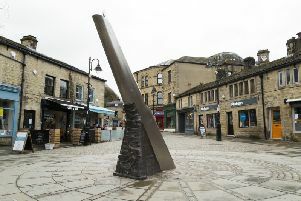 Council leader Councillor Tim Swift (Lab, Town) said it was not about Brighouse: “It’s when you look at the area that it is most suitable to develop,” he said, with the upper valley being steep-sided and the lower valley being flat with better transport links. The detail was there, he said, for example that included in the Masterplanning developed where the Garden Suburbs were concerned. Councillor Jane Scullion (Lab, Luddenden Foot) reinforced that argument saying in terms of planning lots of homes in the upper Calder Valley, everything had changed with the floods of Boxing Day 2015. Councillor John Ford (Con, Elland) said the council needed to be sure the plan was robust enough or the government’s inspector was likely to throw it out. “If you haven’t done your homework very carefully, they will return to London and say ‘Calderdale, you’ve got it wrong’,” he said. Councillor Barry Collins (Lab, Illingworth and Mixenden) said it was ridiculous to say there had been no planning for infrastructure when £40 million funding had already been secured through the West Yorkshire Combined Authority. He said: “We need more houses for our people, more jobs for our people and the Government is telling us to do it – there’s no way round it. “In my view this plan represents a vision for Calderdale’s future. “It respects our geography and topography, sites to protect and our glorious countryside. It’s about more affordable homes. Liberal Democrat leader Councillor James Baker (Warley) said a huge amount of detail was available and claims it wasn’t were laughable. The draft Local Plan should now be published at 9am on Friday, August 10, with a six week period when it will be possible to make formal representations, or comments, on the plan following its publication. This period for representations will close at 5pm on Monday, September 24. The council is following a timetable for publication which was agreed with the Ministry of Housing, Communities and Local Government, which will see the draft Local Plan, including comments from the public, submitted in December 2018. Calderdale’s Local Plan will then be examined in detail by an independent Planning Inspector appointed by the Secretary of State. The examination could last around nine months. Adoption of the plan by Calderdale Council, following receipt of the Inspector’s Report, is expected to be confirmed by the end of 2019.